If Manny Pacquiao’s controversial decision defeat to Timothy Bradley in June didn’t kill all hopes of boxing arranging arguably the biggest superfight in the history of ever, then “Pac-Man’s” lights out loss to Juan Manuel Marquez on Saturday certainly did. While boxing fans have long been clamoring for Pacquiao and Floyd Mayweather to step between the ropes against each other, the two have engaged in a public cat and mouse game circled around enhanced pre-fight drug testing and percentages of guaranteed paydays. Each have taken significantly less interesting scraps in the interim, which have allowed them to fill their pockets and intensify the hysteria surrounding the fantasy fight that will now never come to fruition. The Mayweather vs. Pacquiao (or Pacquiao vs. Mayeather – depending upon who you talk to) predicament is exactly what the Ultimate Fighting Championship has forever claimed is one of the many things wrong with its combat sport rivals. There are only so many GREAT fighters that come along each generation, and more importantly, there’s just a small window for everyone to maximize their earning potential and exposure while the athletes are still viewed as invincible. 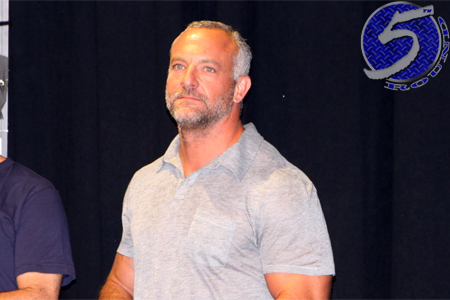 After watching Pacquiao face plant into the canvas, UFC co-owner Lorenzo Fertitta (Pictured) took to his Twitter to let Octagon fans know that they fully understand they have a couple of blockbuster bouts in the bullpen and they don’t plan on letting those opportunities die like boxing did. “Gotta strike when the iron is hot boxing! Lost manny/Floyd 4ever. #gspvssilva #silvavsbones #superfights!” Fertitta tweeted. Of course, Fertitta is referencing potential MMA pay-per-view record breakers in welterweight champ Georges St-Pierre vs. middleweight king Anderson Silva and Silva vs. light heavyweight champion Jon Jones, with the latter marking the biggest tango the promotion will have ever organized. Silva is the common denominator in both bouts, but the most decorated fighter in UFC history will clock 38 this April. GSP (31) is in the middle of his prime and Jones (25) is still years away from even sniffing his. “The Spider’s” iron is still white hot, but it can turn ice cold overnight. Just ask Pacquiao.